Cook the chicken breast in water with a little salt. (Chicken can be replaced with beef, pork or mashed potatoes). Put a small portion of meat on one side of the tortilla and then roll the tortilla to approximately a size of 1.5 cm. Fry the taquito until the tortilla is crunchy. Sprinkle some shredded cheese over the taquito, spread some mashed avocado over it and some sour cream. Put some lettuce and tomato in the plate. 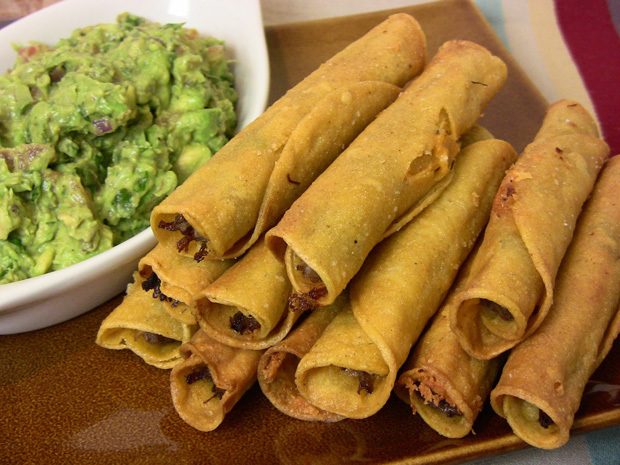 Known as "Flautas" in Mexico, which means flutes.